Today's set of photos show the different bridges we cross as we head north on the I-80 Bayshore Viaduct (34 0126L/R) towards the San Francisco-Oakland Bay Bridge. 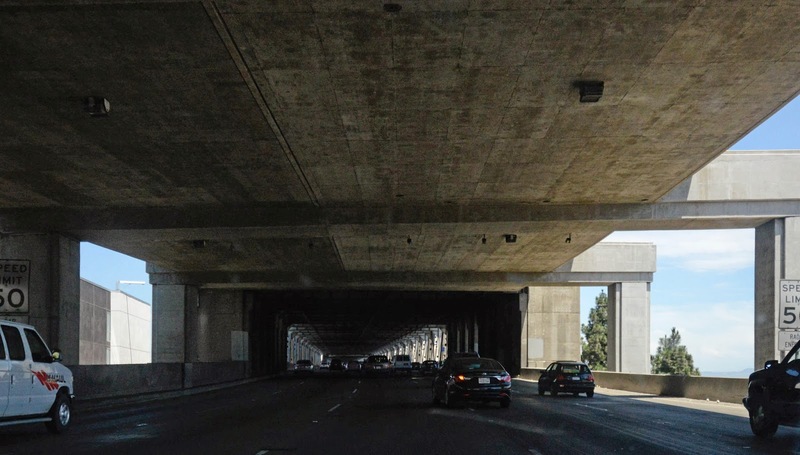 After the Terminal Separation and Embarcadero Viaduct were removed following the 1989 Loma Prieta Earthquake, the West Approach to the Bay Bridge became a combination of retrofitted structures and brand new ramps all designed to stay in service following a large earthquake. Several different ramps come together (supported on big outrigger bents) to become the top and bottom decks of the West Bay Bridge, which can be seen between the columns in the photo below. More information on the project to rebuild the West Approach can be viewed on the Bay Bridge Info Website. San Francisco County, California Bridges: West Approach to the Bay Bridge by Mark Yashinsky is licensed under a Creative Commons Attribution-NonCommercial-NoDerivatives 4.0 International License.